Regular readers will know that I am a skincare lover - I love nothing more than pampering myself and taking care of my skin. 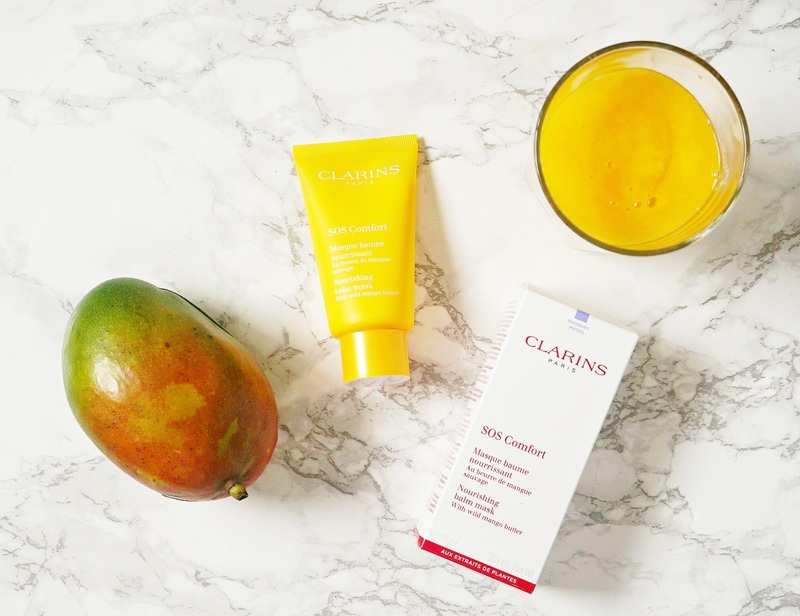 I have a good routine going so for a product to make it into my regular lineup, it has to be pretty amazing but that is what has happened since I received Clarins SOS Comfort Mask. Clarins recently added three new masks to their line up: SOS Hydra for dehydrated skin, SOS Pure for oily and combination skin and SOS Comfort for dry skin, which is the one I chose as my skin is more dry than dehydrated, although I must admit that I am tempted by the Hydra mask too. The SOS Comfort mask can be used as a quick fix - applied after cleansing & exfoliating and left to work for 10 minutes before removing the excess with a cotton pad soaked in toner for an instant brightening and plumping effect, or it can be used as an overnight mask, which is my preference. It is described as a nourishing balm mask and that description could not be more accurate - this thick, luxurious product (that is slightly scented of mangoes - yum!) cocoons the skin, instantly making it feel less stressed and more comfortable. It literally is like a hug for your skin with that feeling of comfort of laying your head on the most comfortable pillow in a freshly made bed - utter bliss. As I said, my preferred method is to use it as an overnight mask and I wake up to soft, smooth, nourished and radiant skin. My hair doesn't stick to my skin and my face doesn't stick to my pillow, which is always a bonus! This mask would be perfect for using on flights or on holiday to inject some moisture into parched skin. It is a 75 ml tube, which is travel friendly and I really love that it is in a lightweight tube rather than a pot - both for travel and hygiene purposes. If you have dry or stressed skin, you need this mask in your life! At the moment, I am resisting the urge to use it every night and have limited myself to 2/3 times weekly. It is priced at £30 or €38 and is available from Clarins counters nationwide or online from the Clarins site. Have you tried any of the new Clarins SOS masks? All products are bought by me, unless otherwise stated. Clarins kindly sent this mask to me. Opinion is always my own.